Pastry chef Jerome Chang ’99 has forged his culinary niche by introducing traditionally high-end desserts into New York City street fare at mouth­watering prices. Chang, co-founder of Dessert-Truck and its Lower East Side brick-and-mortar spinoff, Dessert-Truck Works, began selling sweet concoctions in Greenwich Village out of a re­vamped postal truck in October 2007. His menu features delica­cies such as vanilla crème brûlée and a highly acclaimed warm chocolate bread pudding with an unexpected but delectable bacon custard sauce. The most expensive item on Chang’s menu is $6. Though he purchases ingredients from the same vendors many four-star restaurants use, Chang is able to offer a less expensive product because he sells larger quanti­ties while avoiding the overhead expenses of a restaurant. Chang, a 2004 graduate of the French Culinary Institute’s six-month pastry arts program, landed his first job in January 2005 as a pastry cook at Cope-land Restaurant at the Westin Governor Morris hotel in New Jersey. From there he moved on to Le Cirque, a renowned French restaurant in Manhat­tan, where he was pastry sous chef from May 2006–April 2007. The concept for DessertTruck came to Chang while he and his former roommate and business partner, Chris Chen ’06E, ’08E, ’08 Business, experimented with a late-night snack in their Harlem apartment. 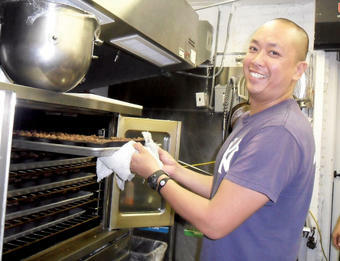 Jerome Chang ’99 places a batch of his acclaimed chocolate bread pudding into the oven at the DessertTruck Works kitchen. PHOTO: NATHALIE ALONSO ’08Permit troubles forced DessertTruck to shut down for al­most a year beginning in August 2009. During that time, Chang established his storefront, which opened in January 2010. He now runs both the truck and the store with a team of likeminded colleagues. “The gourmet truck concept wasn’t just a novel idea. It broke with old-fashioned molds, with traditional assumptions that there’s always been a very specific setting for high-end, well-made food,” says Susana Garcia, also a former Le Cirque pastry sous chef, who joined DessertTruck full-time in 2009. Sincere and straightforward, Chang grew up in a suburb of Kansas City. He did consider himself a “foodie” as a Col­lege student, but his academic aspirations at the time were fueled by the same commitment to equal access that inspired DessertTruck. “I am extremely passionate about social justice, equality of opportunity and figur­ing out why social differences exist,” says Chang, who majored in African-American studies and notes that he grew up in a segregated neighborhood. Eager to live in New York City, Chang chose Columbia as the venue in which to explore those interests. He earned a J.D. from the University of Illinois in 2002 and practiced law for a year at a New York City insurance defense firm before attending culinary school. The same gut feeling that later spawned DessertTruck led Chang to quit his job and enroll at the French Culinary Institute. His gambles have paid off, as DessertTruck boasts a robust and loyal clientele. Business received a boost in 2009 with Chang and Chen’s appearance on Throwdown!, a Food Network program in which celeb­rity chef Bobby Flay competes with chefs known for a par­ticular dish — in Chang’s case, bread pudding — and attempts to produce a superior version of the dish. The episode was filmed in October 2008 and aired in January 2009. Chang and Chen prevailed. Nathalie Alonso ’08, from Queens, is a freelance journalist and an editorial producer of LasMayores.com, Major League Baseball’s official Spanish language website. She also writes “Student Spotlight” for CCT.